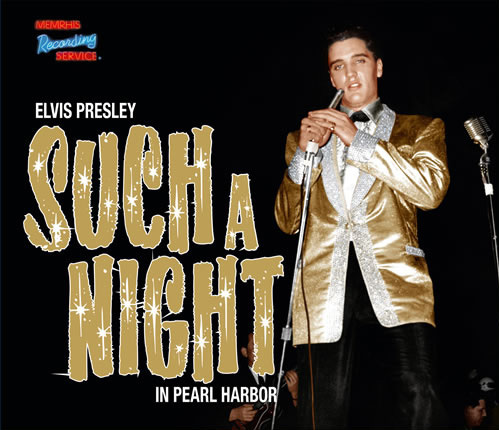 Earlier this week it was announced that the next CD/book release from the Memphis Recording Service (MRS) will be Elvis' benefit performance in Hawaii for the USS Arizona Memorial. 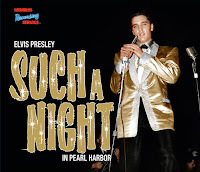 Titled Such A Night In Pearl Harbor the press release promises a re-mastered CD where "The quality is of this concert is far superior than anything of this ever released before." Also included on the CD is a 30 minute radio broadcast from Hawaii presented a week before Elvis’ arrival. It promoted the concert for the memorial fund, playing selected tracks from Elvis’ Christmas Album and His Hand in Mine, released at that time including words by Elvis Presley. 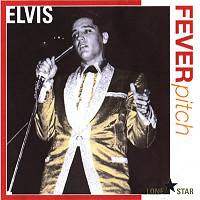 Now, this particular copy of the bootleg, titled Fever Pitch, was missing the backside of the cover so I really didn't knew what was on it (although I could make an educated guess as it featured a shot of Elvis from the benefit concert in Hawaii). Unpacking all my stuff when I arrived back home in Sweden, I gave it a quick spin. But I skipped the second track after a couple of seconds when I heard it featured the song "House Of Sand." The rest of the CD included a couple of songs from the actual concert, an interview with Elvis made on the set of Blue Hawaii and rounded off with "Sand Castles." As I really didn't think the album offered anything new I put it away on a shelf and forgot all about it. Anyway, reading about the bootleg on the Elvis In Norway site I noticed that track 2 was listed as "House of Sand" (one line only) followed by "Radio Broadcast." Digging out my copy of Fever Pitch I played track 2, and there it was, after 15 seconds of "House Of Sand," the radio broadcast promoting Elvis' benefit performance a week later. Turned out I'd skipped that track too fast while listening to the album seven years ago! I found the broadcast interesting, featuring among others, a U.S. Navy admiral talking about the construction of the memorial and thanking Elvis Presley and his supporting troops in the show. After I played it, I made a mental note to write a post about it, suggesting that FTD release it together with the show in improved sound quality (after all, the audio restoration technique must have improved since 1980, when the show was released on the box set Elvis Aron Presley). Tom Moffet: Where you happy with the turnout and the response in the show? Elvis is my daughter's idol. She just went to an Elvis party commemorating his birthday, it was held here in Testaccio, Rome and there were several Elvis impersonators. I love him too! I would like to follow you but I don't find your followers list. Greetings from Rome, Italy. Hi Francesca, and thanks for visiting my blog! I hope your daughter had a great time at the Elvis party! I've just added the possibility to follow my blog by e-mail. All the best from Gothenburg, Sweden.